If you need built-in sensors, relay and more feature, please take a look at Raspberry Pi Cellular IoT Application Shield. 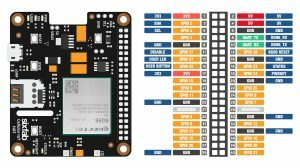 With the Sixfab Raspberry Pi Cellular IoT HAT you are able to send or receive data over LTE-M and NB-IoT cellular networks without needing gateways. LTE-M (Cat M1) and NB-IoT (Narrowband IoT or Cat NB1) are both for who is looking to take advantage of Low Power Wide Area Network (LPWAN) technology. In the meantime, the 2G networks have been started to shut down in some countries. The Quectel BG96, lies on the middle of the Raspberry Pi Cellular IoT HAT, is a series of LTE Cat M1/Cat NB1/EGPRS module offering a maximum data rate of 375Kbps downlink and uplink with worldwide coverage. This LTE add-on for Raspberry Pi also supports GNSS and GPS for the need of building location, navigation, tracking, mapping and timing applications. At this LTE HAT for Raspberry Pi, we’ve provided an easy-to-use Python library for AT commands over UART or USB connection with a bunch of tutorials enable makers, engineers, integrators and developers to easily design their applications. Long Stackable Header – No need to solder, stack and use! Answered by the admin Power consumption details will be added soon the description. Answered by the admin You can make it work if you connect the respected pins. Answered by the admin We can help you update the firmware. Answered by the admin You can contact your provider for NB-IoT SIM. Answered by the admin What is your location of use? What are the providers available in your location? You will need to contact them or check their website. Answered by the admin If there are no overlapping Pins, then you can use it. You can also connect on HAT via USB and other via PINS. Any SIM which supports Cat.M1, Cat.NB1 or eGPRS will work with the HAT.